Liars, Leakers, and Liberals (2018) examines the dark forces that have not accepted Donald Trump’s victory. From the dishonest media to Hollywood hypocrites, weak-willed republicans to the “deep state” of the intelligence community, these forces are now attempting to destroy America’s president – a patriotic, family-oriented winner whose no-nonsense approach is exactly what the United States needs. The media today is unashamed to lie in an attempt to damage Donald Trump’s presidency. Incredible as it may seem today, there was a time when the media loved Donald Trump. Back in the 1980s and 1990s, you could barely stroll past a newsstand without seeing Trump’s face smiling back at you. The media couldn’t get enough of Trump, from his business deals to his charitable donations. Coverage of Trump wasn’t always positive. The media never held back, for instance, when Trump’s casinos had problems or when his wealth fell in the 1990s. But it was always fair, running well-sourced stories and including Trump’s version of events. How things have changed. Today, the liberal news media hates Trump so passionately that, according to the author, it lies about him relentlessly. Consider the winners of Trump’s Fake News Awards, which are awarded to the liars who oppose him. ABC’s Brian Ross was one winner. Ross ran a story alleging that Michael Flynn, Trump’s national security advisor, was preparing to testify against the president; he claimed that Trump had ordered him to contact Russia before the election. This, according to the author, was a lie. The story was based on poor sources, and completely false – more akin to tabloid gossip than to investigative journalism. Ross is not a stupid man. But, according to the author, he, like so many others, allowed his blind, liberal hatred of Trump to cloud his judgment. If you don’t believe the media has an anti-Trump bias, look at the statistics. A Pew Research Center study found that of all stories about Trump, 62 percent were negative. This compares with only 20 percent about Obama, and 28 percent about George W. Bush. In the author’s view, the situation has been exacerbated by the realization, by station chiefs and newspaper bosses, that anti-Trump lies sell. During the election campaign, the New York Times hit an online readership of 1 million for the first time. In the first month of Trump’s time in office, the Times signed up 132,000 new subscribers. Two months after the election, the Washington Post recruited 60 new newsroom staff. Magazines like the New Yorker and the Atlantic set new subscription records. These news organizations even have a term for this – the “Trump Bump.” They know that anti-Trump lies sell more papers. And so, the author claims, they keep on lying. Hollywood is stuffed full of lying, hypocritical liberals who think they are better than the rest of us. Many Republicans are getting in the way of Trump’s agenda, rather than standing squarely behind it. President Trump tells the truth about illegal immigrants while liberals are busy protecting them. The deep state spied on Trump’s campaign and has tried to sabotage his presidency with the Russia investigation. The witch hunt against Trump continues, though it’s turned up nothing. The story of the Uranium One deal shows the messed-up priorities of the FBI. Look past the lying, liberal propaganda and you’ll see that there is no better man to be president than Donald Trump. President Trump is making America great again, boosting the economy and achieving foreign-policy miracles. 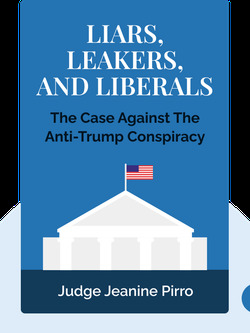 Start your free Blinkist trial to get unlimited access to key ideas from Liars, Leakers, and Liberals and over 3,000 other nonfiction titles. With bitesize text and audio, it's easier than ever to find the right ideas to transform your life.